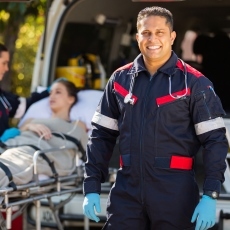 If you get very sick or badly hurt and need help right away, you should use emergency medical services. These services use specially trained people and specially equipped facilities. You may need care in the hospital emergency room (ER). Doctors and nurses there treat emergencies, such as heart attacks and injuries. For some emergencies, you need help where you are. Emergency medical technicians, or EMTs, do specific rescue jobs. They answer emergency calls and give basic medical care. Some EMTs are paramedics - they have training to do medical procedures on site. They usually take you to the ER for more care. If you or someone you know needs emergency care, go to your hospital's emergency room. If you think the problem is life-threatening, call 911. Article: Resuscitation of the Pregnant Patient. Article: Cardiovascular Emergencies in Pregnancy.